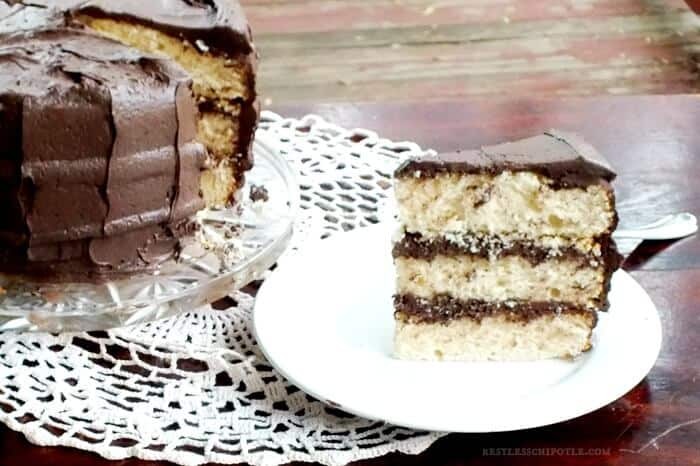 Triple layer cake recipe has just a whisper of almond flavor and thick, puffs of whipped, dark chocolate frosting snuggling between each layer and enveloping the top and sides of this scrumptious dessert. It is easy and looks elegant, making it your perfect go-to recipe for everything from birthdays to fancy dinners. You know, cupcakes have been in the limelight for several years. Yes, they are cute and easy and delicious but they aren’t cake. Oh, they have their place on the dessert table, for sure, yet there are times when I miss a nice slice of really good layer cake. I think layer cakes are a dying art that should be revived. Cake mixes be damned, they can’t compare to a homemade layer cake! This one is sky high. I doubled my normal recipe for frosting for two reasons. This is my favorite frosting ever and I knew I would lick spoonfuls of it so I wanted to make sure that I had enough. I wanted generous layers of frosting between the layers of cake to make it look gorgeous and to keep the flavors balanced. This layer cake is so high that you may want to stick drinking straws down through the layers to steady them. Also, for the prettiest slices be sure to chill this for an hour or so before slicing. Other than that the cake is super easy to make and put together. The layers are sturdy yet tender so they do not break easily. I mean, you don’t want to go play Frisbee with them or anything but if you let them cool they will not break apart when you try to put the cake together. The buttermilk makes it tender and light. The cake isn’t super sweet but it is very flavorful. You can make it one day, brush the sugar syrup on it and then frost it the next day to save time. You can use different flavorings, add citrus zest, or whatever you want to make it yours. This is a recipe that you will memorize for sure. Cake flour is a must, y’all. Don’t complain to me that it isn’t tender if you use all purpose flour in this. A towering, tender vanilla cake lightly flavored with almond is generously filled and frosted with a deep, dark, whipped chocolate frosting. Cream butter and sugar together just until light and fluffy. Beat in the vanilla and the almond flavorings. Add dry ingredients alternately with the buttermilk. Add the unbeaten egg whites and beat at medium speed for two minutes. Divide equally between 3 greased and wax paper lined 8″ round pans. Mix water and sugar in a heavy saucepan. Beat the butter and vanilla until it is fluffy. Mix the Confectioners, cocoa, and salt with a whisk until well blended. Slowly beat the confectioner’s mixture into the butter. Continue to beat until well blended. Turn the mixer to highest speed and add 1/2 cup of the cream. Beat until light and fluffy, with a whipped consistency, adding more cream as needed to achieve the right texture. Brush the cake layers lightly with the sugar syrup. You won’t use all of it so put the rest in a tightly covered jar in the refrigerator. It will keep for months. Fill and frost the layers with a thick layer of frosting. Chill before serving to allow it to firm up. Cake freezes well when unfrosted. 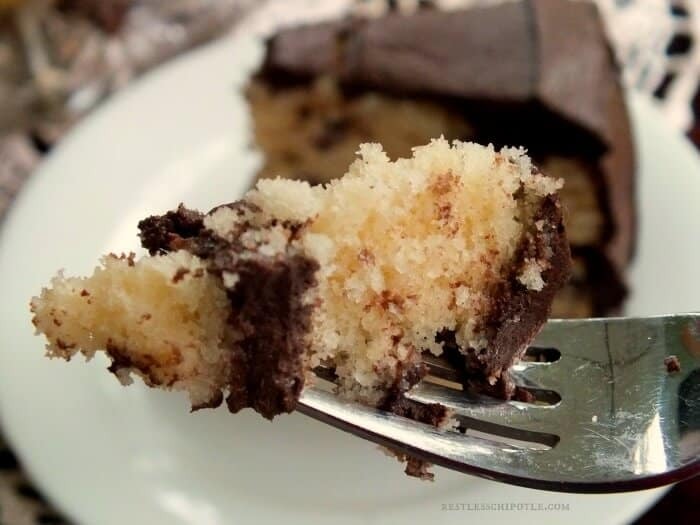 If you freeze the frosting it can get a little grainy but is other wise good. 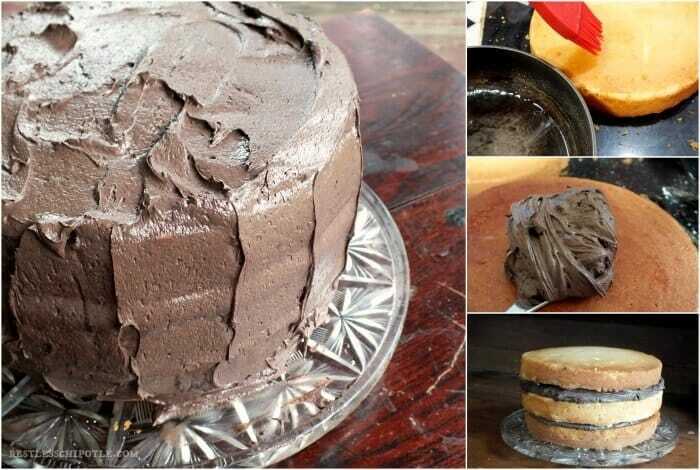 Looks absolutely amazing, I promise, I will stick with the cake flour and am definitely going to make this cake! 🙂 I am not sure I could do that! I am such a sucker for a good layer cake! This looks so good! Me too! I don’t make them nearly enough! I’m keeping this one in my arsenal for the next M (or I) get a “cake yen”. This definitely hits the spot! Not only is it beautiful, but has me wanting to skip lunch and go straight to dessert! You had me at whipped dark chocolate! Wowza!